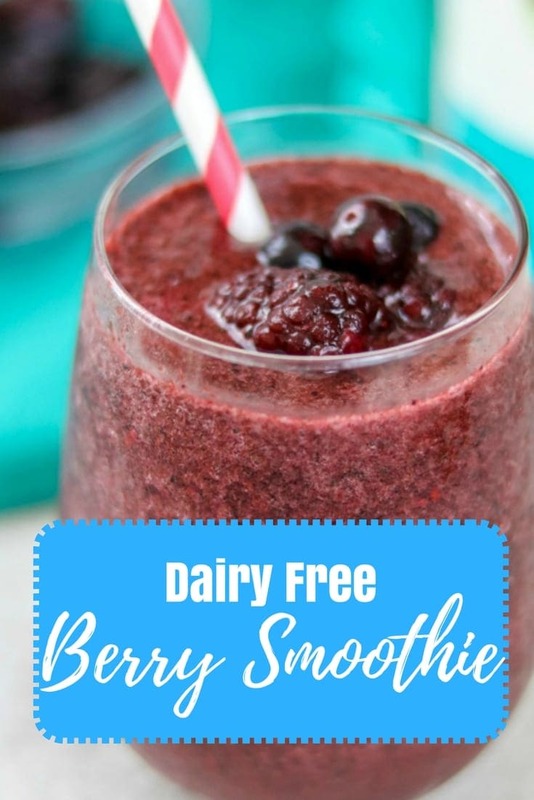 Dairy Free Berry Smoothie: A delicious blend of kale, berries, and Pomegrante Blackberry Juice creating a superfood smoothie and serving you up a huge dose of antioxidants, electrolytes, probiotics. Vegan. 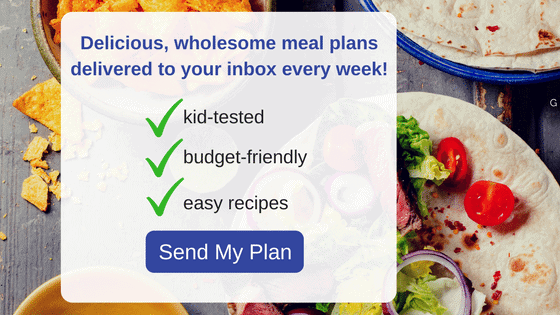 Paleo, Lower Sugar and Gluten Free versions included. I have a question for you–Are you and/or your kids afraid of green smoothies? I know that green smoothies can scare some people–heck, at times I am afraid to try some of them and I LOVE my greens. I am about to share with you a Berry Green Smoothie that is going to change your mind! 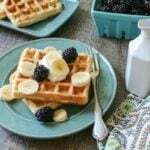 I served it to several neighborhood kids after they had a lesson on nutrition at school and they all devoured it and asked for more–true story! That should seal the deal that this smoothie is good. Still not convinced, my husband loves it. And he HATES kale. 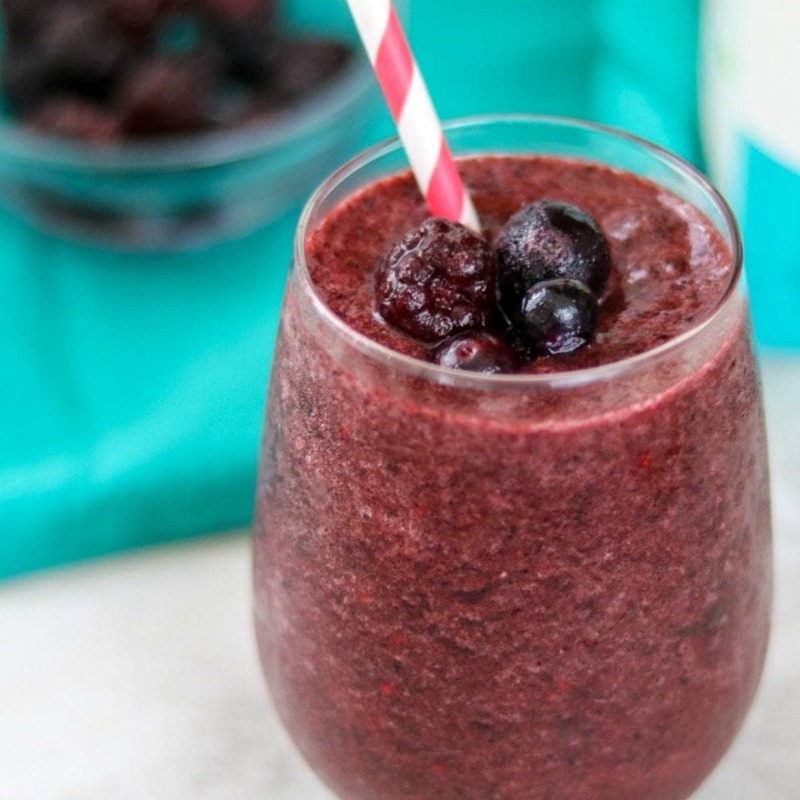 The fruit is key in this easy berry smoothie recipe. 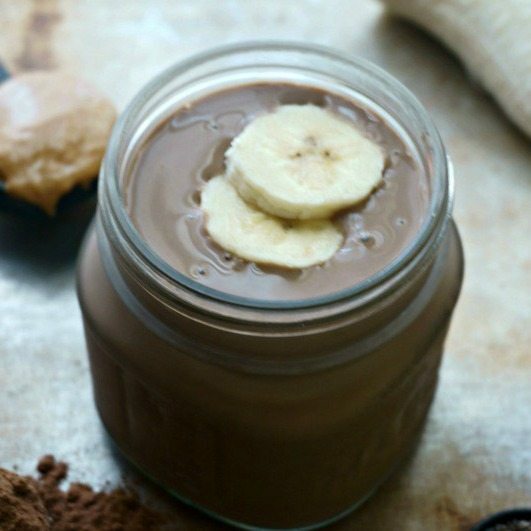 You want to give the smoothie sweetness to tempt the pickiest of eaters, but in a healthy way. Berries vibrant color hides the color of the kale well–so technically this smoothie is NOT green in color, just packs in those nutritrient dense greens. I also use as GoodBelly Pomegrante Blackberry Juice as my base. 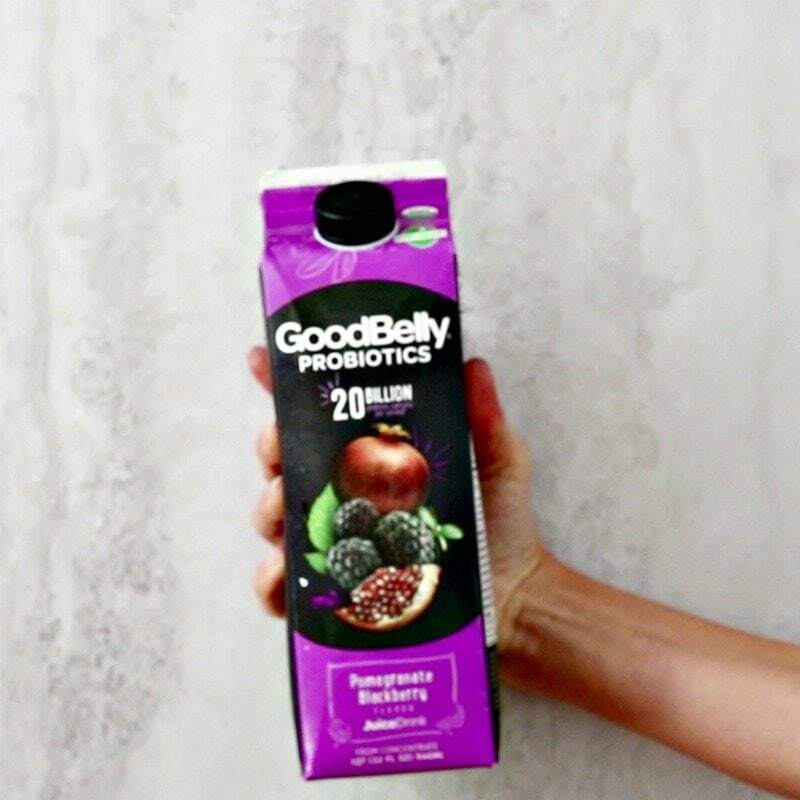 This is really where you can pack some superpower in your dairy-free smoothie, turning it into Probiotic-Rich SuperfoodSmoothie by using GoodBelly Pomegrante Blackberry Juice. GoodBelly Pomegrante Blackberry Juice is a delicious beverage all on it’s own and it’s sweet taste wins picky kids over! I throw in frozen Kale, but Spinach would be great as well. But to finish off the smoothie, I add an ingredient that makes most people go, HMM?!! Flaxseed Oil. Flaxseed oil adds Omega Fatty Acids and additional fiber. Flaxseed oil is a healthy fat and in order to fully absorb nutrients from fruits and veggies, you need to pair them with a fat. This Berry Smoothie is truly a powerhouse of nutrients and you will be able to say you actually like Green Smoothies!! I choose to use the Pomegrante Blackberry Juice because it is my kids’ favorite and helps to mask the kale tates. However, coconut water keeps the sugar content in this lower and is just as tasty. I used Frozen Kale because it is ALWAYS in my freezer. You of course can use fresh kale or even fresh or frozen spinach. Just be sure to blend well to fully break down. I have made this with strawberries and blueberries with just as much success. Place all ingredients in blender and blend until perfectly smooth. 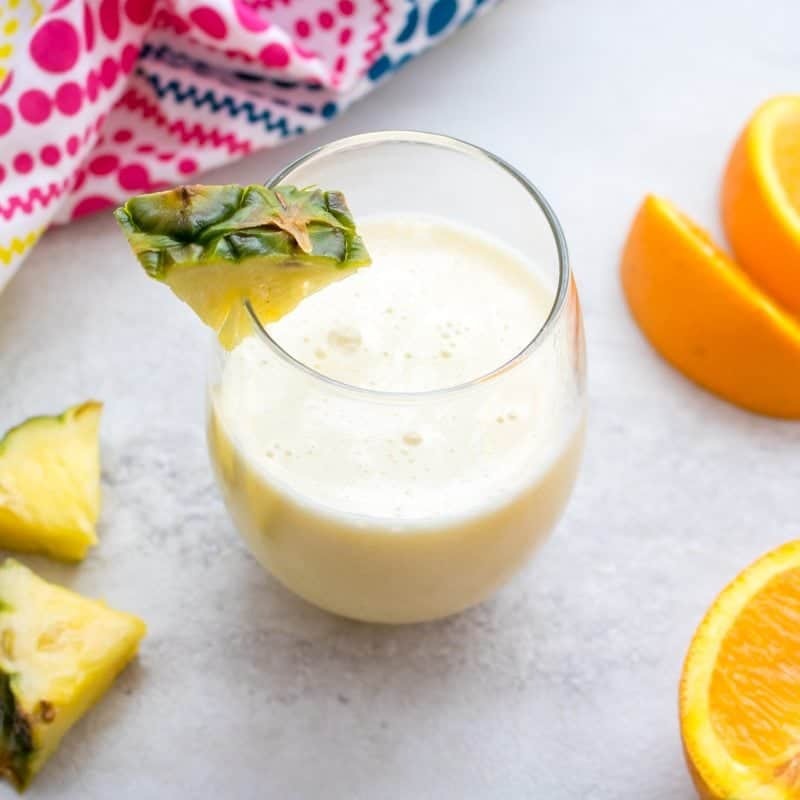 To keep this smoothie lower in sugar and gluten-free, use GoodBelly Coconut Water. You will still have the probiotics and the coconut water gives a very mild nutty flavor. It is delicious. 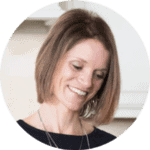 This is a great way to get a reboot and some greens for sure Alisa! I wish I lived in an area where blackberries were free 😉 But oh how I love them myself. 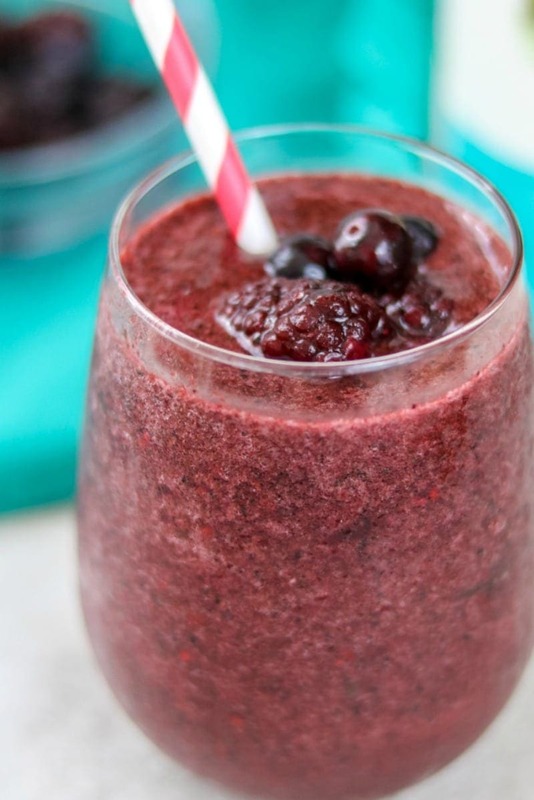 Enjoy this smoothie! I am always looking for new morning smoothie recipes and this one is a keeper!!! I love a good smoothie for breakfast! This looks so easy and so yummy!